Grupos Diferenciales, which specialises in producing high-tech gears for mechanical transmissions used in sectors such as the automotive industry, maritime transport, railway and aeronautics, performs technologically advanced tasks while providing high added value, using difficult to machine materials with close tolerances. In its ongoing search for new technological solutions to increase its efficiency and competitiveness, there was a need to find a flexible, adaptable solution that could be highly customised, making it possible to finish the parts in a single set-up. After evaluating different solutions existing in the market, Grupos Diferenciales decided to entrust DANOBAT with the development of two new edquipments that will allow it to produce large parts that are consistently compliant with stringent quality standards. The main goal of the company, with high quality and short lead production times, was to have a cutting-edge equipment that would allow it to manufacture larger components so as to expand its customer portfolio. The main challenge consisted of producing optimum quality parts in a standardised manner. The team of mechatronics engineers at DANOBAT designed and developed both horizontal and vertical grinders for Grupos Diferenciales. They are highly versatile and capable of turning, measuring and grinding parts of different sizes. The equipment has enhanced the tolerance and roughness of machined parts. The VG-1000/700 vertical grinder is equipped with a multi-position head for hard turning and grinding of parts, as well as a measuring arm that makes it possible to verify whether the manufactured components meet the standards and provide optimal quality. This grinding machine has a high stiffness and was designed bearing in mind stability and vibration elimination requirements in hard turning processes. The measuring tool integrated in the machine is able to measure internal and external diameters, faces and cones, with repeatability of less than 1 micron, thereby ensuring the dimensional geometry of the parts in less than 5 microns. DANOBAT’s experts designed this highly-customised machine so that it could be adaptable to the already existing clamping tools. Therefore, the system has a main magnetic clamping system intended for manufacturing medium to large-sized diameters and a self-centring jaw chuck for batches of smaller parts. One of the needs to be addressed by Grupos Diferenciales was the versatility and flexibility of the equipment. This is why DANOBAT included an automatic tool changer in the grinder that makes it possible to select the most appropriate tool for each type of part to be manufactured on each occasion. To complete the tasks commissioned, DANOBAT also developed a horizontal grinder, the HG-72-2000-B12, capable of machining parts with a length of up to 2,000 mm, a diameter of 640 mm and a weight of 1.5 tonnes. 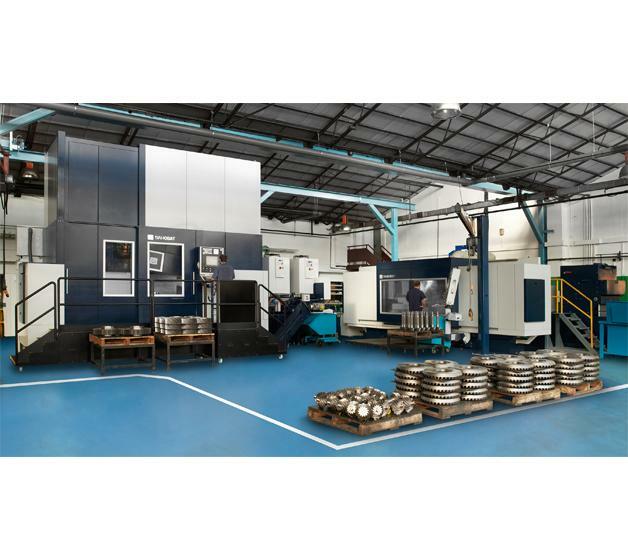 One of its main features is that it is equipped with a head that includes three grinding wheels, making it possible to machine external diameters, faces and threads. This head, which rotates around its vertical axis and reaches every point on the part, is powered by a 45 kW motor that reaches peripheral speeds of up to 45 m/s, with grinding wheels that have a maximum diameter of 610 mm. Thanks to these features, the device is able to respond to all grinding needs, including parts with Ra 0.1, in a single set-up and with guaranteed geometric quality. The inclusion of the DANOBAT MDM-300 multi-diameter measuring device, which runs in parallel with the machining process, is advantageous since it prevents subsequent measurements and enables single-stage grinding. This will ensure that the part meets all the requirements established in the design. The DANOBAT MDM has a repeatability of ± 1.5 microns, makes it possible to measure a wide range of diameters and once the grinding process has ended but before removing the part, post-process verification may be performed. Moreover, the machine includes a filtration unit making it possible to filter up to 15 microns. This contributes significantly to the quality of the end product, improves roughness and allows for enhanced finishing. Thanks to the tools that have been developed, this horizontal grinding machine also enables to clamp down all parts while ensuring that they may be ground with one single clamp.